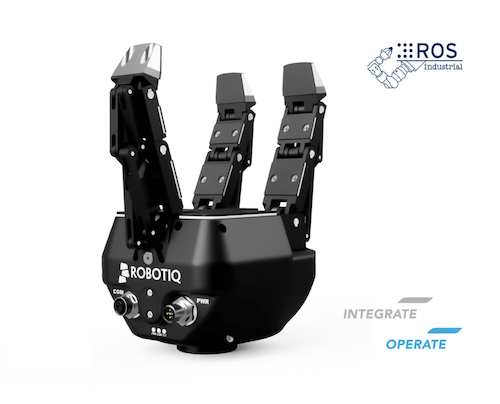 Robotiq grippers and FT 300 are now fully compatible with ROS Kinetic! We are very happy to announce that all Robotiq grippers along with the FT 300 are now fully supported on ROS Kinetic! Please visit our ROS wiki page to learn more. Indeed, our official package stack is ready to be downloaded directly from our Github Repo, provided by ros-industrial. This update makes it even easier now to control your robotic devices, this time directly from your PC, by building your own application. Start building simple to more advanced applications now and efficiently make Robotiq products work in synergy with other sensors and actuators! All ROS versions from Groovy to Kinetic are now fully supported. ROS Melodic will be supported as well soon! Fully control and get data from all your Robotiq devices using your own personal computer. Easily integrate your Robotiq gripper(s) and FT 300 to your custom C++ / Python robotic project. Use Gazebo to visualize and simulate the 3-Finger Adaptive Gripper. Benefit from a large (and growing) number of ROS projects involving Robotiq devices shared by the open-source community. We really hope you'll enjoy using our ROS package stack!